Similarly to her work in the terrific I Am Princess X, in The Agony House author Cherie Priest tells a gripping story with comic book illustrations mixed in to tell a piece of the tale. When Denise discovers the hidden comic book in the creepy attic of her new house (which she bluntly refers to as a “craphole” at all times), the book seems to be a clue to the unexplainable events happening to the family as they try to make the old place livable once again. Denise is a great main character — clearly very smart, devoted to her family, but unhappy with being dragged away from her friends back in Houston and forced to live in this awful house. As she settles in and gets to know some of the teens in her neighborhood, we get a picture of the devastation left by the Storm (as they refer to it), even after so many years. The book deals with issues around economic hardship, gentrification, and privilege, not in a preachy way, but by showing the struggles and resentments of the characters and the new understandings they need to reach in order to get along. The social lessons here feel organic and important to the story, and I appreciated seeing the characters come to terms with one another in all sorts of interesting ways. 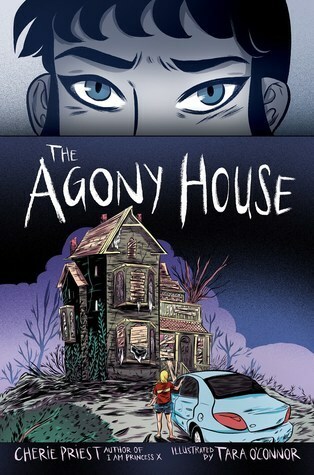 I’d place The Agony House somewhere between middle grade and young adult fiction. The main characters are high school seniors, but the events and the narrative would be fine for younger readers, middle school or above, so long as they’re okay with ghosts and spookiness. I really enjoyed the comic book pages and how they relate to the main story, and thought it was all very cleverly put together. As an adult reader, I saw the plot resolution twist coming pretty early on, but that didn’t lessen the satisfaction of seeing it all work out, and I think it’ll be a great surprise for readers in the target audience. Parallel stories set in different times, one told in prose and one in pictures, converge as Ella unravels the mystery of the girl next door. Oh my, this was a great read! 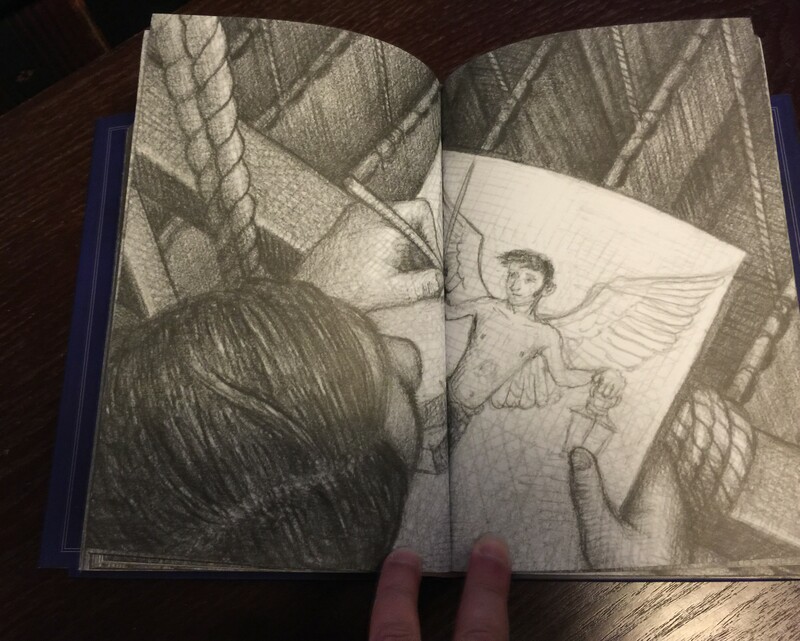 Very much reminiscent of the style of Brian Selznick, Thornhill is told both in words, via Mary’s diary, and in pictures, via illustrations of Ella’s experiences. 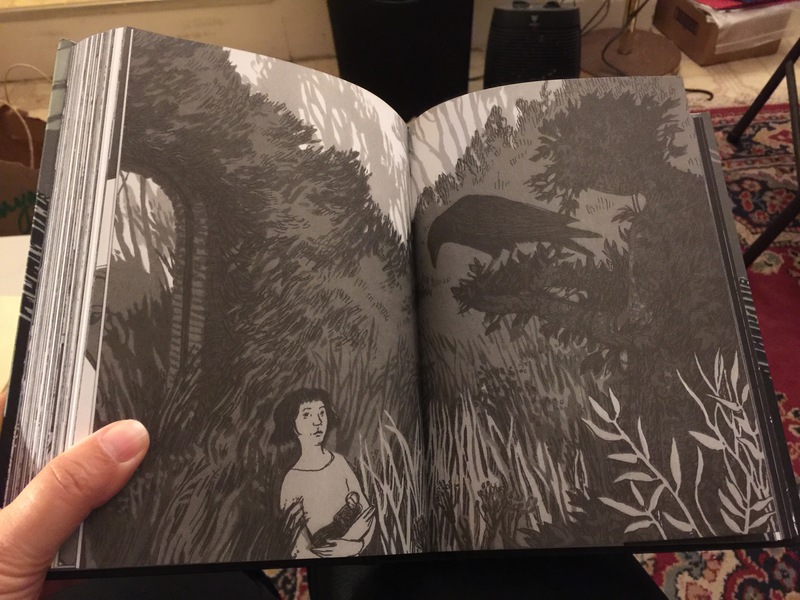 Author/illustrator Pam Smy does an incredible job of moving the story forward through the black and white illustrations from Ella’s world, which are stark and evocative and ever-so-ghostly. The tale told through Mary’s diary is heartbreaking, and the first-person narrative is particularly effective. We see how Mary is an outcast even among outcasts, friendless in this home for unwanted girls, locking herself away in her own private sanctuary to escape the insidious, cruel attention of the house bully. Mary constructs a whole world for herself with her books and her carefully crafted puppets, but even this sanctuary ends up being violated. It’s wrenching to read of Mary’s pain, and all too easy to understand how her pain turns to anger and then to a burning need for revenge. Meanwhile, Ella’s story is sad in its own way. Through the pictures on her walls, we come to understand that Ella’s mother has died and that she’s being raised in this new home and new town by a father who’s usually absent. No wonder Ella becomes fascinated by the spooky house she can see from her window and the mystery of the light she sees shining from the attic window. 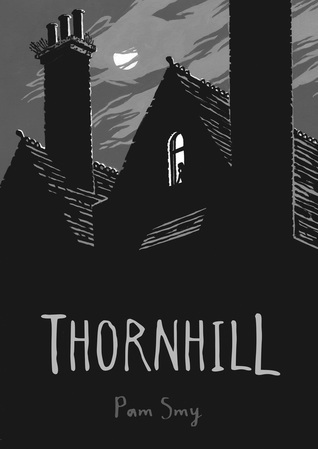 Thornhill is a spooky, powerful, and quite definitely sad story of two girls from different times, bound together by loneliness. It’s haunting in all the right ways, and I simply loved the use of words and pictures to tell one complete story. 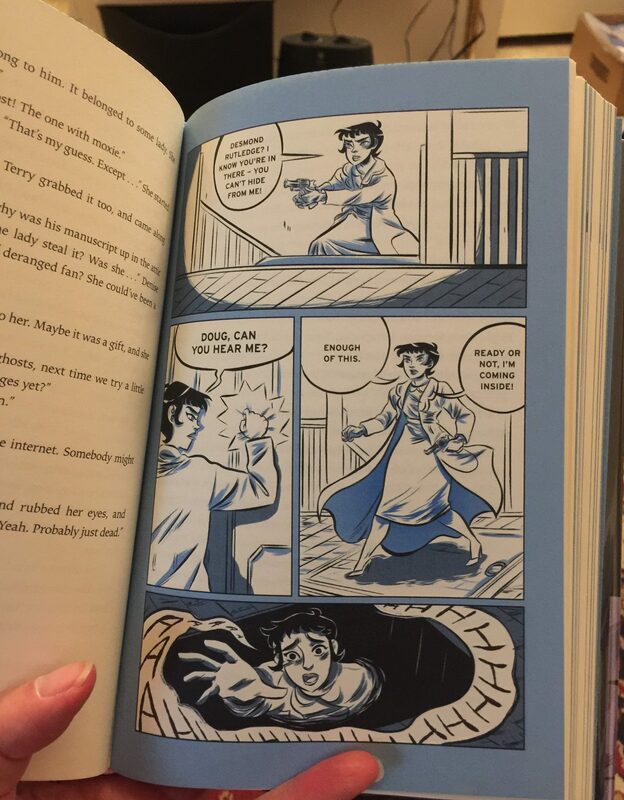 In The Marvels, author (and artist) Brian Selznick applies the technique he’s used previously (and so effectively) in The Invention of Hugo Cabret and Wonderstruck. 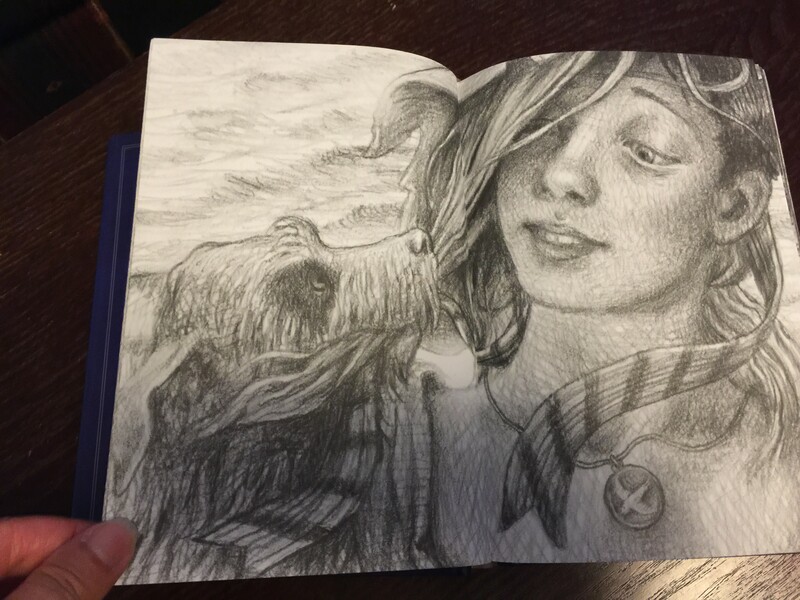 In these books, the drawings aren’t illustrating the story — they’re telling the story. 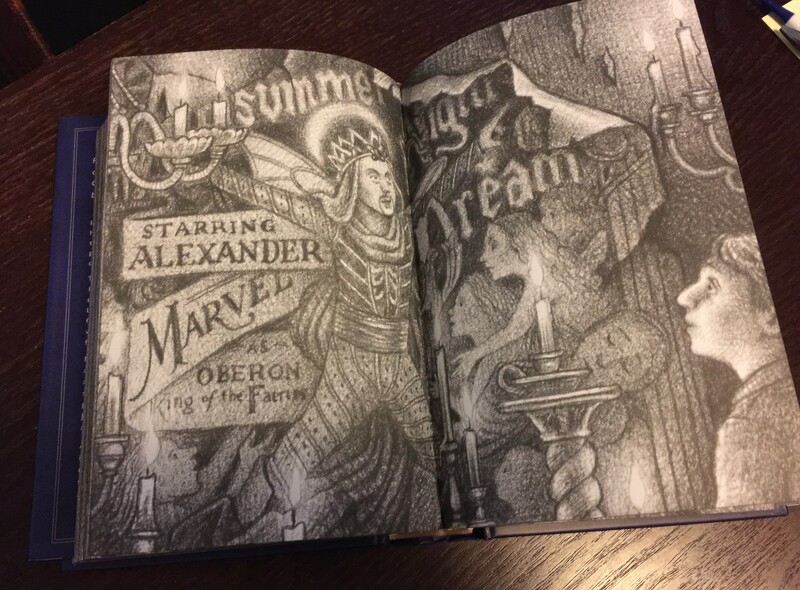 Over 600 pages in length, The Marvels is told purely through illustration for the first 390 pages. And such gorgeous illustrations! Each set of double-facing pages contains a black and white pencil drawing, magnificently detailed, that serves to tell a piece of the story. 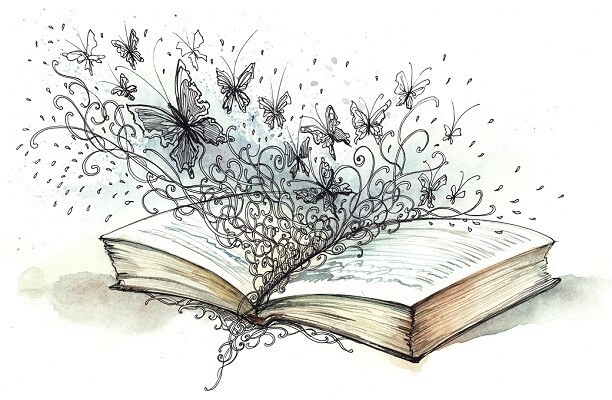 From page to page, the tale unfolds, and the pictorial story is full of drama and emotion. The story of The Marvels begins in 1766, with two brothers, Billy and Marcus, shipwrecked during a storm at sea. Rescued from the island where he washes up, Billy and his dog Tar find their way to London, where they’re adopted by the crew building the Royal Theater. Billy’s story of his brother’s love inspires the theater’s designers so much that Marcus is immortalized as an angel painted on the theater’s ceiling. From there, the generations follow: Billy grows up and adopts an abandoned baby, who in turn grows up to become a star of the theater, and onward for several more generations. The Marvel family is the world’s most revered family of actors, acquiring world renown, while at the same time dealing with madness and the final disappointment of a descendant who only wants to escape from the family business. The story ends abruptly with a fire in the theater… and we turn the pages to blank whiteness, and then to the story’s continuation, in printed form, in 1990. The next several hundred pages are told via the narrative of a 12-year-old boy named Joseph, who runs away from his repressive boarding school and seeks shelter with his eccentric uncle Albert, a man whom he’s never met before. Albert lives in a house that seems more like a museum, employing gas lights and candles to illuminate a mansion full of old-world treasures. Joseph is intrigued by the mystery of Albert’s home, and tries to get his uncle to open up about his secrets and share the truth about their family’s past. How does this connect to the story of the Marvel family? I’m not telling. You’ll want to find out for yourselves. What I will say is that it wasn’t what I expected, but I was enthralled none the less. At first, I felt impatient with the written part of the story. The illustrations are so beautiful (that word again!) and pulled me into their world so completely that I hated leaving it behind. But, bit by bit, the story of Joseph and Albert pulled me in as well, and teasing apart the hints to try to unravel the secrets was equally engrossing. 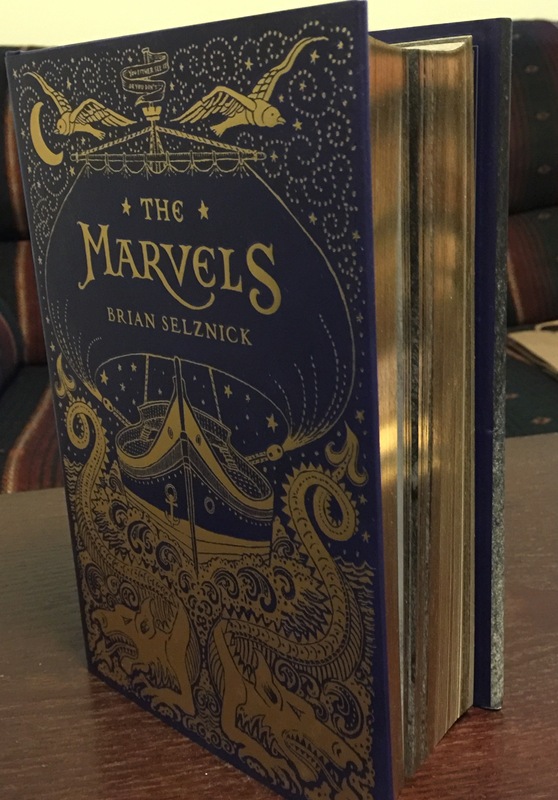 Several inches thick, with gilted edges and a gorgeous cover that feels like a throwback to an old-fashioned library edition, The Marvels is just so lovely to look at. This is one book you’ll want in a physical copy for sure — an e-book just won’t be the same. The story is powerful in both its parts, with themes of love, devotion, and continuity, family commitment and inheritance, and a sense of wonder that is hard to describe. I found myself so absorbed in the mood created by this book that it was hard to re-enter the real world after finishing. 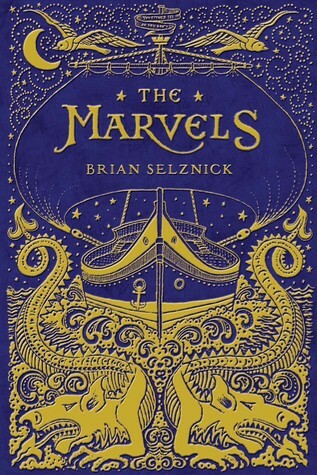 Wonderstruck may still be my favorite Brian Selznick book, but The Marvels is either a tremendously close second or perhaps right on par with Wonderstruck. 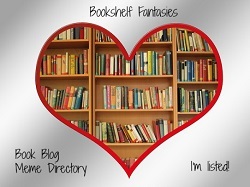 For sure, both deserve a permanent place on my shelves, and are books that I’ll return to over the years. Reading these books is an immersive experience, and the power of the illustrations cannot be overstated. What can I say about a book like this? Beautiful and awful are two words that come to mind, but neither do justice to the power of A Monster Calls. A Monster Calls is the story of Conor O’Malley, a 13-year-old so isolated by suffering that he’s become practically invisible to the world around him. Conor’s mother has cancer, and despite her cheery reassurances, the latest round of chemo does not seem to be going well. Conor’s father departed years ago for a new life with a new wife and baby in America, and Conor lives alone with his mother in a small English town, where he attends school in a fog of despair and loneliness. At night, though, the nightmares start. Until one night, Conor is visited by a monster — a giant creature formed from the yew tree that Conor can see from his bedroom window. The monster seems like a creature from hell, bent on destruction and threatening to eat Conor — but what it wants is a story. The monster tells Conor its conditions: The monster will tell Conor three different stories, and then it will be Conor’s turn to tell the monster a story, but it must be the truth. Conor knows which story the monster wants from him, and it’s the one thing he absolutely does not want to give voice to. The monster isn’t all that it seems, and as the story-telling proceeds, the monster becomes the voice of reason and honesty for Conor. Through the monster, Conor is forced to confront his own rage and sorrow, the fact that belief in something — anything — matters, and the subjective nature of terms like “good” and “evil”. 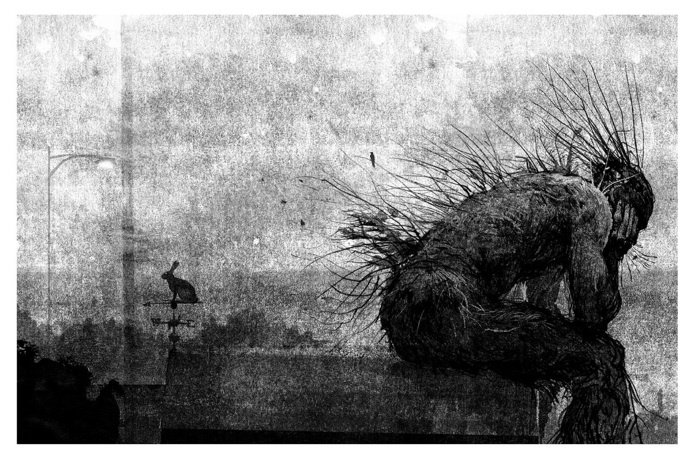 The illustrations in A Monster Calls are stark and glorious. Jim Kay’s black and white inks are stunning — scary and bleak, portraying the monster as otherworldly and frightening, yet also as something natural that seems to belong in the mundane world of garden sheds, grandfather clocks, and schoolyards. I don’t know that I can really articulate my feelings about this book without going off on a personal tangent. I know that I have certain emotional triggers in books, and A Monster Calls hits all of the most powerful ones for me. When I was eleven, my mother was diagnosed with breast cancer. After four years of struggle, illness, and suffering, she died at the young age of forty-four. I was fifteen at the time, and although many years have passed and for the most part I don’t actively think about those years any longer, the emotions still lurk below the surface, never far away. 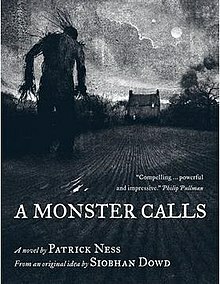 Reading A Monster Calls brought my experiences from those years right back to me. Conor is overwhelmed by rage — a rage that literally destroys whatever is in its path. All-consuming too is his guilt, a guilt that fuels his nightmares and drives him further and further from the people around him. He goes through the motions of a normal kid’s life, but it’s as if he’s an alien in the midst of humans. His experiences and inner life are so separate, so “other”, that it’s no wonder the kids at his school seem to see right through him. He’s scared for his mother, but he’s also scared for himself. He wants to keep her with him, but he wants her to stop suffering. He’s angry, he’s sad, and he just has no idea what to do with all of the emotions that threaten to engulf him at any second. I get it. The scariness of watching the parent you count on turn into someone who needs protection. The helplessness of seeing a good and kind person suffer — and seeing that person worry more about her child’s well-being than her own. Being on the receiving end of well-intentioned reassurances that cannot possibly come true. It’s awful and it’s painful and it’s a reminder, especially to a child, of just how little in life can be controlled. So yes, I read A Monster Calls and could barely breathe by the end. Reading Conor’s story was an instant and visceral reminder of my own experiences during the terrible years of my mother’s illness. The book feels real and true. It’s not a soapy melodrama, but an honest look at the messy emotions that are bundled up in loss and grief. In spare but lovely prose, Patrick Ness captures all of this and more, and the illustrations are stunningly perfect. A Monster Calls is an award winning children’s book, geared for ages 12 and up, but it’s certainly something that adults should seek out as well. My 10-year-old, having seen me absorbed by this book all week, has asked if I’d read it to him when I finished. I think he’s mostly fascinated by the artwork — understandably so. I hate to turn down a request for a book. As someone who always read “up” (grabbing whatever books my older sister was reading whenever she wasn’t looking), I don’t usually pay too much attention to recommended age ranges for reading materials. And yet, I don’t think my kiddo is really ready for something like this yet. It’s one thing to read about loss and grief in a fantasy setting such as Harry Potter — quite another to read about a boy going through a horrible loss in a real, recognizable world. I do think I’d like him to read A Monster Calls eventually — but perhaps in a few years, when he’s ready to read it on his own and really be prepared to think and reflect about Conor’s experiences. 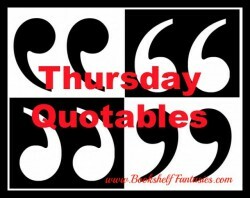 According to the Author’s Note, the characters and premise of this story were created by the author Siobhan Dowd, who herself died from cancer before she was able to bring the concept to fruition. 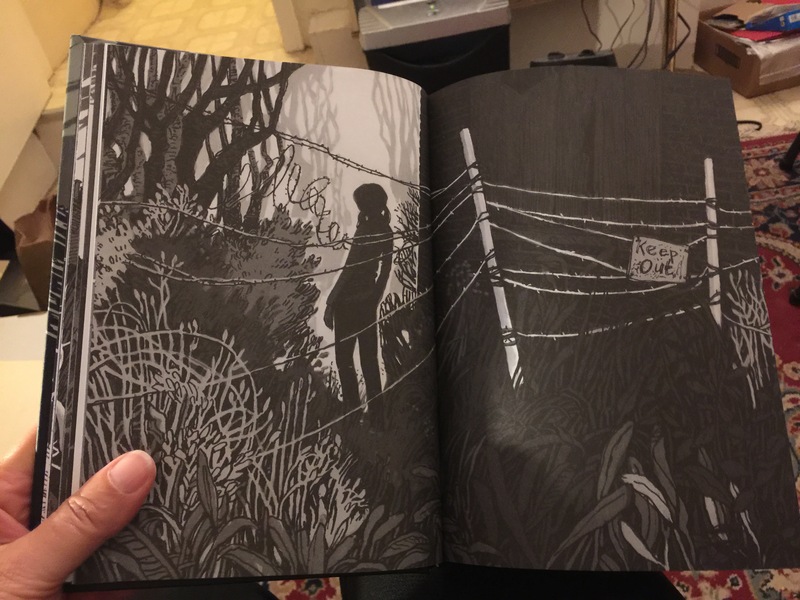 Patrick Ness was asked to take her initial concepts and turn them into a book, and he has done so in way that feels like both a beautiful achievement on its own and a lovely tribute to Siobhan Dowd. A Monster Calls is quite an accomplishment on so many levels, and all I can say is that it shouldn’t be missed.